Just bought a 2008 XK. Owners manual indicates connections in the center console. They are not there. Anybody know what gives? If you do have them they may be covered by a rubber cover. They are sited at the back of the console by the fob slot. 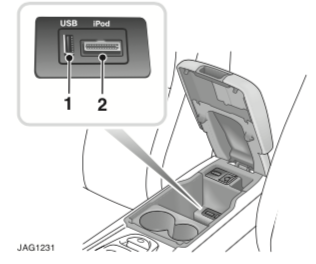 The iPod Audio Connectivity Module was an option on the 07, 08. Not sure about 09. It became integrated in 09 or 2010. Thank you Sean. That is what I found out when inquiring at the dealership. However their recommendation is that while there are aftermarket products to facilitate that connectivity they do not recommend any due to the possibility of other electrical issues that may result. Hmmm. I’m not quite tracking the dealers comment Randy. The part I linked to (C2P16491) is a Jaguar part. The ACM was made by Denison for Jaguar. Nothing aftermarket about it. In fact, once it’s installed, It needs to be activated using Jaguar specific software known as SDD (Symptom Driven Diagnostics). There is a selection in the software to turn on the ACM. Once turned on, you will see the options in the audio selection of your touchscreen. I just picked a link from the UK previously. I’m sure others sell it. Used ones aren’t easy to find anymore but sometimes available on eBay. Thank you Sean. It seems to me the interference is inconsistent and one is wise to listen to the dealers recommendation. Randy I know this is late notice but I purchased a Bovee 1000 and it is awesome. I can view my songs from my iPhone on my touchscreen and select. Great $70 I ever spent. Actually Dan, I interpreted his comment on 2/24 to mean that the ACM isn’t installed and if that’s correct, there’s nothing to plug a Bovee into. I agree with you, money well spent. That is correct, I do not have the ACM module available to plug in to. The dealership has confirmed some of the references here that modifications can mess with other systems. This seems to be confirmed by other glitches in the systems. Right after buying the car this spring the left rear brake light indicated it was out. That was about the same time the check engine light came on. I saw the reference that the gas cap could tigger an engine fault if not tightened to three clicks. I replaced the bulb and tightened the gas cap, no further issues. Then last weekend the brake bulb on the other side failed (of course!). And along came also the check engine light. DTC 0193. Replaced the bulb and check engine light extinguished. Gremlins, for sure! I don’t dare make any modifications to his screwed up system, will wait for a newer model with integrated iPod controls!